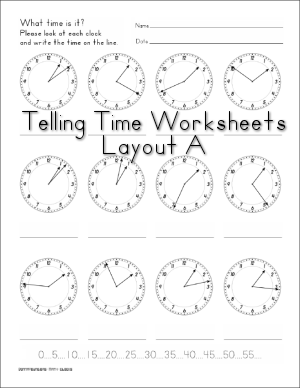 Print clock worksheets, blank clocks, and a teaching clock for your students. I recommend printing on card stock. Supplies and instructions are listed on the file. Instructions are included on the file. 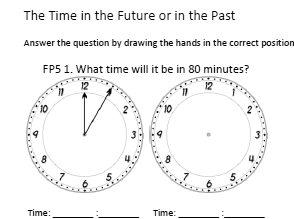 The two clock worksheets below are easy. The times on each clock are 12:00, 1:00, 2:00, etc..
Print blank clock worksheets for customized work. Wording - "What time is it? Please look at each clock and write the time on the line." Most, but not all, worksheets will have 12 unique minute hand positions. The number of represented hours will vary and that is how these worksheets are grouped. Use the worksheets with fewer hours represented when you want to focus more on the minutes. Group 1- Worksheets Hour 1 through Hour 5 have all 60 of the minute hand positions represented. Group 5 - Worksheet #5 is the easiest out of this group because the time on 11 out of 12 clock end with zero or five.